If instructors have enabled grading in Discussions, students will have equivalent options in their view to view their scores. The same information is shown to students in Course Map and to instructors in Activity Meter. 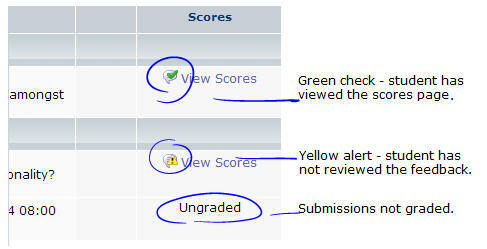 Students click on View Scores to review their instructor’s evaluation and see the points they earned. Instructors can go over the maximum point value of a category, forum or topic and award extra points to students, as appropriate. Below is a screen shot, showing what students will see in their view. Students can also see if their discussions have been graded and are ready to be reviewed in Dashboard and in a site’s Home Page. The number on the “Review” icon includes discussion items and assessments that are graded and ready to be reviewed.